The Embera-Wounaan people of Darién, Panama, live in communities in their own reservation lands along rivers in eastern Panama. Maintaining much of their traditional ways, they make a living farming plantains commercially and by other basic means. Families live comfortably but very basic, in small wooden homes with palm-thatched roofs, raised above the ground to endure Panama’s heavy rainy season. Most of their activities take place outdoors—from washing clothes and dishes in the river to cooking. They hunt local animals such as peccary and paca for food, and also fish caught from the river. Schools are located within the communities and have basic necessities. Classes are taught in Spanish but the local indigenous languages are maintained in homes. Embera people are very friendly and welcoming. Since the opening of the Canopy Camp in Darien in 2014, the Canopy Family has been working directly with local Embera communities. Since then, Canopy Family has become particularly involved with the community of Nuevo Vigia Embera, located on the banks of the Tuquesa River. 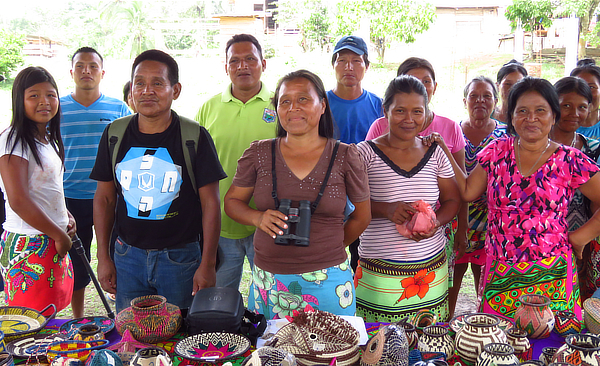 Nuevo Vigia, with a population of 600 made up of 90 families, has embraced our presence in Darién and since 2014, with our assistance and guidance, have become involved in local ecotourism. The relationship was initiated by maintaining clean trails on their land that we use on our tours, to building a large rancho (roofed hut) where they display their artisan crafts made by the community members for our guests to browse and purchase. They appointed four naturalist guides in the community who have since, with our guidance and educational resources provided, learned the local bird species (and now learning butterflies, too!). Likewise, a young man, Felipe Aji, was appointed as tourism director within the community and manages our visits efficiently and passionately. When we visit Nuevo Vigia with our guests, we support the community financially by paying an entrance fee, using their motorized dugout canoes (called “piraguas”) and boat drivers to travel to and from the community via the Chucunaque and Tuquesa rivers, and pay a fee to the local guide. 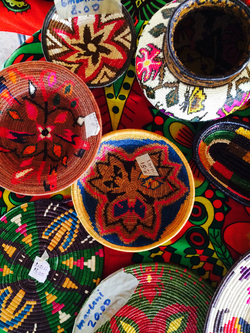 Our guests and guides also purchase their beautiful, hand-made woven baskets, plates and masks, further supporting the community and promoting responsible tourism. We would like to further assist them and promote responsible tourism by providing supplies and useful products to better their day-to-day life, and this is where we reach out to our extended family—our guests who visit the Canopy Family lodges, particularly, Canopy Camp Darien. Nuevo Vigia’s location along a river within the indigenous territory means that all basic goods have to be brought in from outside. This is both time consuming and costly, as it requires fuel for the boat ride and finding car transport to the nearest town with a store. A trip to town represents a significant amount of a family’s income, and may often be only available once a week, meaning some basic needs have to wait. Additionally, many families must focus on the most basic needs, meaning items such as school supplies are luxuries that cannot always be afforded. Through this program, we believe our additional provisions of select items can alleviate some economic pressures while also providing items essential to education and health, which will improve the community’s quality of life. Make your travel more meaningful by filling extra space in your suitcase with useful items that we can pass on to Nuevo Vigia and other communities we are working with in Darién. By contributing supplies—from school notebooks to sports equipment and personal hygiene items—you can help us enrich their lives even more and promote responsible tourism. Fun fact: the name Embera means “people” in their local language (Embera). We are proud members of Pack for a Purpose, a responsible tourism initiative that allows travelers like you to make a lasting impact in the community at your travel destination. If you save just a few kilos of space in your suitcase and take supplies for the projects we support in need, you’ll make a priceless impact in the lives of our local children and families. Please see what supplies are needed for our project/projects.